Magnesium is an essential mineral for human health. The recommended adult dietary allowances (RDAs) are from 310 mg to 420 mg per day. 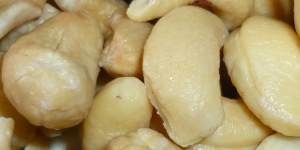 Cashews – an excellent source of magnesium. Magnesium is an essential mineral for human health. For adults over 31 years, the recommended dietary allowance of magnesium is 420 mg for men and 320 mg for women. The full dietary allowance table for all ages is shown in the Data Zone. We absorb magnesium into our bodies through our small intestines and excrete it through our kidneys in urine. You can see a list of foods that are high in magnesium a little farther down this page. The list shows the amount of magnesium in a standard portion and also the percentage of recommended daily allowance. Foods that are particularly high in magnesium, and common foods that have a useful amount of magnesium are included in the list. For example 20 pumpkin seeds provides 5% of your daily value. Many antacids and laxatives contain magnesium. Very high doses of magnesium can cause diarrhea and stomach cramps. This page is for information purposes only. It should not take the place of medical advice.